Watercolor on paper, 22 1/4 x 30 in. In 1930s Southern California, most watercolors were painted in the “California Watercolor Style” identified by large-sized papers, broad expressive brushwork, and American Scene subject matter. Emil Kosa, whose father was also an artist, inherited a prodigious talent and was, for most of his career, an artist with the motion picture studios. Easel works, such as his many oil landscapes and watercolors of rural California, were produced on his personal time and between film work. He was a rapid and driven worker. American Scene subject matter, which became popular in the Depression, celebrated America’s good qualities, such as her fertile croplands and her happy, liberated and productive citizens. Artists who produced such works in their youth, often continued them through their career; thus From Boyle Heights, a celebration of downtown Los Angeles, was produced in the mid 1950s. (Boyle Heights is a historic suburb on the east side of downtown Los Angeles.) Most Southern California watercolorists preferred to paint California’s farmsteads and so Kosa’s rare scenes of downtown Los Angeles, painted in the early post-World War II period, distinguish him from his peers. 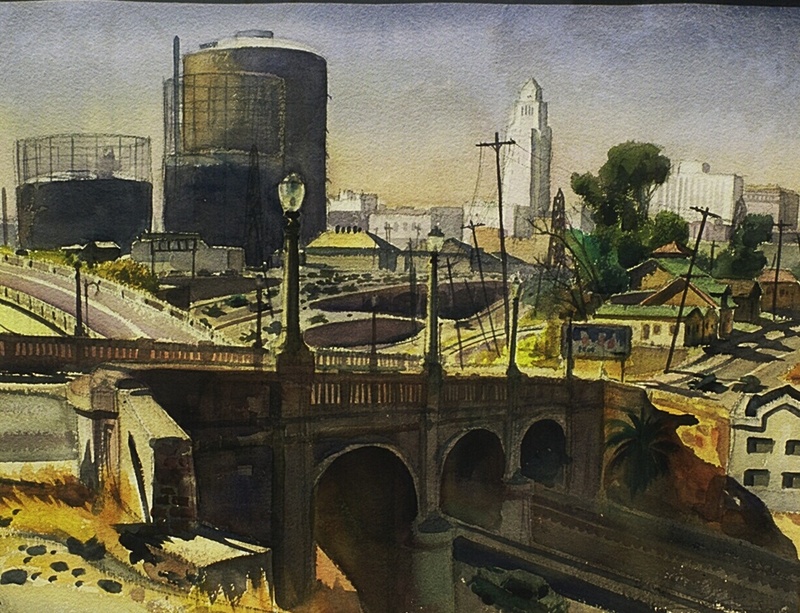 Visible in this work are key landmarks such as the pyramid-topped skyscraper of city hall and the gas company tanks; other views he made of LA show some of the new freeways for which the city was to become known. Provenance: Abells auction, December, 1989; exhibitions and publications: exhibited and listed in brochure, Cowie Galleries, Emil J. Kosa, Jr., N. A., March 1959; exhibited and reproduced in color in Scenes of California Life 1930-1950, Todd Madigan Gallery, California State University, Bakersfield, March 9 - April 10, 1991, p. 15, 65; reproduced in color Nancy Moure, California Art: 450 Years of Painting & Other Media, Los Angeles: Dustin Publications, 1998, p. 244; Oakland Museum of California.